Learn how to create a "nurture" campaign using your Browse Abandonment solution. WHY WOULD I WANT TO SEND BROWSE ABANDONMENT NURTURE CAMPAIGN? Optimize your send strategy by personalizing each touchpoint and focusing on specific-shopper intent with a Browse Abandonment nurture campaign. Today, you may send one follow up retargeting email to a website browser and then go back to sending marketing campaigns that feature your latest promotion or newest content. It’s almost as if you have forgotten what the shopper has just told you with their browsing behavior. A nurture campaign allows you to keep the conversation going and expand on that browsing intent to aid in product discovery and ultimately conversion. A few of the messages in the conversation will look more like a traditional Browse Abandonment campaign-- the specific product browsed being the focal point of the content. The additional messages in the conversation will still feature those specific browsed items, but more the creative will be expanded to include more relevant products that reflect the preferences of the subscriber based on their browsing behavior to further nurture abandoners with additional, relevant messages that serve as a reminder of the abandoned item but additionally offering different, yet engaging content. Below you can see some interesting statistics you may not know about Browse Abandonment. Below is a visual representation of a Browse Abandonment campaign. You'll notice that the abandoned product is featured in the nurture emails-- sometimes more predominantly and sometimes in a more discrete location or size, accompanied by Recommendations of popular or similar items. Add Recommendation in Browse Abandonment emails plus three relevant nurturing messages to the campaign. The nurture emails show the abandoned item(s), but do not speak about it. It’s another way to promote the item you know the customer is interested in. These customers should be pulled out of your normal broadcast cadence. The six-message series includes three traditional Browse Abandonment messages-- each featuring personalized product recommendations based on recently browsed products, in addition to highlighting the item browsed. Deployed on the wait days between the more marketing-focused Browse Abandonment messages are three nurturing messages that appear as typical marketing messages with personalized product recommendations, including the item abandoned and recently browsed products. It is important to note that browse abandoners should not receive regular marketing emails during this time. Below is an example of a Browse Abandonment Nurture campaign. 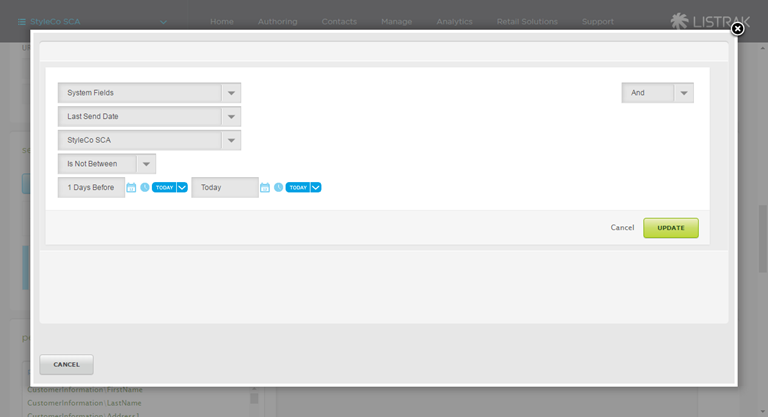 Modify your program to add messages in between each time a customer will receive an abandonment email. NOTE: This will vary depending on your set up of your Browse Abandonment campaign. 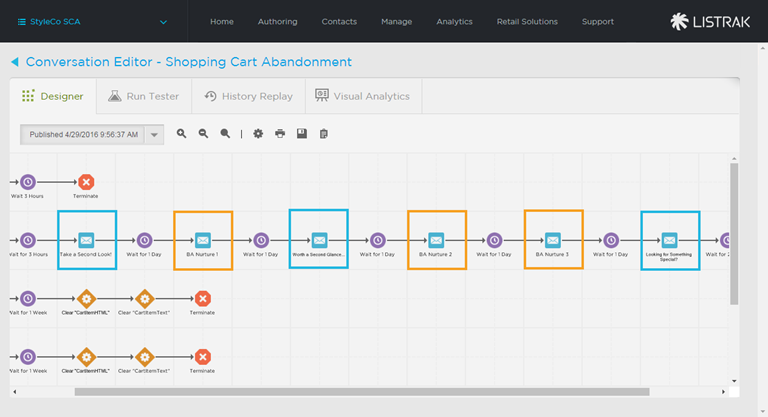 In the screenshot below, the steps in blue are the Browse Abandonment messages and the steps in Orange are the Nurture Emails. Each email has a one day wait step in between. A simple way to keep nurture customers out of your regular marketing sends is to add a filter when authoring that marketing send. 2. Go to New Message (or Saved Messages if you've already started working on your message). 3. Under segmentation filter settings click Edit Filter. 4. Create the filter as shown below. NOTE: The reason we are checking within the last one day is because, for Browse Abandonment, the longest wait step with have is one day between messages.